This is not a cosmetic or rhetorical organization with lots of fine sounding political statements (though we have a few of these too!). The Anarchist Black Cross Federation is an organization based on work and ongoing organizing efforts to support and defend PP/POWs using anarchist and anti-authoritarian organizational structures (no, that is not a contradiction). Membership in the ABCF will be based on your work in this area. If you believe you or your group is sincerely interested in becoming part of this collective struggle by starting an ABCF Support Group, follow these steps. You should initially read the ABCF Constitution and Structure and the ABCF Guide to PP/PoW Support. Read carefully over these documents in their entirety. Reading the Constitution will give you a good idea of what will be expected of you as an ABCF collective, and what you will be able to expect from the rest of us as a federation. The Support Guide will illustrate the principles we work by and the policies you will be expected to uphold as an ABCF chapter. After you read all of this material, contact us and we’ll go over any questions or comments you have. This may be the most important step – making sure you understand these documents and the ramifications they will have on any work you do as an ABCF member. Because of this, don’t be timid; ask whatever questions you may have, big, small or seemingly unimportant. Ask! If something is unclear to you, or information you would like to know is not as clear, please ask. It is through your questions that we have been able to make the language in our texts easier to understand, but read through the documents carefully, take them seriously, and look into what they mean. Asking questions whose answers are easily found in the texts may indicate that you have not done so. The first thing that should be made absolutely clear is that the ABCF is a Federation of ABC collectives who have come together and united around the issue of PP/POWs. Not all of the ABC groups in North America are in the ABCF, but we still try to maintain a working relationship with all ABC formations. One of the things we have united about is who and what a PP/POW is. We are very clear that a PP/POW is someone who is in prison as a result of conscious political activity ON THE STREET. We do not consider prisoners who went to prison for socially-motivated charges and later became political activists inside prison PP/POWs. The reasons we use these criteria are made plain in the ABCF Guide to PP/POW Support and the Constitution and Structure. Being a part of the federation means that you voluntarily agree to that. The ABCF Guide to PP/POW Support– Includes the working policies of the ABCF in our work with PP/POW’s, information on what documentation is, why and how to get it, rules and regulations prisons impose on PP/POW’s you will need to know to maintain a support relationship, information on visiting prisoners and more, all compiled with the assistance of PP/POW’s. It also includes a brief historical analysis of the ABC and why a federation was needed to move forward. ABCF Constitution and Structure– The mechanics of the ABCF. The 4 basic principles of the ABCF (Unity of Purpose, Tactical Unity, Collective Action and Discipline and Federalism) Details what you need to do to start an ABCF collective. The differences and responsibilities between Branch Groups (BG) and Support Groups (SG). What the Prisoners Committee (PC) is and what it does. How these different bodies participate in the Federation Council (FC) as well as the By-Laws of the ABCF. PP/POW’s Supported by the ABCF– Contains brief biographical sketches of PP/POW’s who participate in the ABCF’s Prisoners Committee and PP/POW’s who receive Warchest or Emergency Funds. The ABCF– Brief fold-out flier used to introduce people to the ABCF and to solicit further participation. Building PP/POW Subsistence Programs– Fold-out leaflet explaining the need for building programs to support PP/POW’s, and outlining the different programs the ABCF has built. 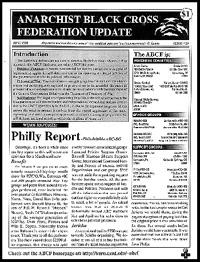 Copies of several ABCF publication– The ABCF publishes newsletters that contains articles and news relating to political prisoners, as well as chapter reports by ABCF collectives. Reading through all of the material in the kit is essential and you are required to know it. Thorough knowledge of these documents is required for ABCF membership and all ABCF members are held accountable to them. Contradicting something contained within these documents can be a violation of one of our Four Basic Foundation Principles of the ABCF and can be grounds for suspension or possibly expulsion. If you have read this far, this is the notification of your responsibility to know this material. Okay. Done all that. Now what? Once you have done that and still are interested, you would submit an application to the Federation. That application would be a notice to all ABCF groups that you are interested in being a Support Group. It should say things like where you heard of the ABCF, why you are interested in joining, work you have done for PP/POW’s in the past (if any) and what you plan to do in the future, especially as an ABCF SG. The application can be sent to Los Angeles ABCF-BG (P.O. Box 11223, Whittier, CA 90603) for publication in the ABCF Update, or you can send it to all BG’s, SG’s and the PC. The ABCF’s FC will then make an evaluation of the application and contact you if there are any concerns or welcome you into the ABCF. Once you are admitted into the ABCF as a new SG, you should send in your first work report to the very next ABCF Update. This will inform all Update readers of the existence of a new ABCF local and what you are doing. We realize this seems like a long process, but it is very important that everyone in the ABCF understands what it is they are getting into and that it requires a serious commitment to these issues. It is not designed for anyone’s convenience, but at the same time, it should not be difficult for those of us who are interested in participating in the protracted nature of PP/POW support. And again, membership in the ABCF is 100% voluntary. Being a member means you voluntarily agree to our principles and policies. Therefore, it is crucially important that you know our principles and policies and agrees with them beforehand. It is because you agree with them that you should join the ABCF. You should not agree with them just to join the ABCF, and no one is forcing anyone to do so. It is your right to disagree or to not participate, and we respect your right to organize something different.